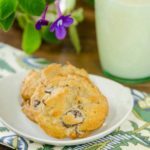 A recipe for Coconut Pecan Chocolate Chip Cookies. They are buttery, soft, and have sweetened coconut flakes, chopped pecans, and chocolate chips throughout. Preheat oven to 375 degrees F. Line baking sheets with parchment or non-stick liner. Whisk together flour, baking soda, and salt in a medium bowl. Cream butter, granulated sugar, and brown sugar in a large bowl using a hand mixer on high speed. Add flour and beat on low speed until just combined. Do not over-mix. Stir in chocolate chips, coconut, and pecans. Drop by tablespoonful 2 inches apart onto prepared baking sheets. Cool cookies on baking sheet for 1 minute. Transfer cookies to a cooling rack and cool completely.